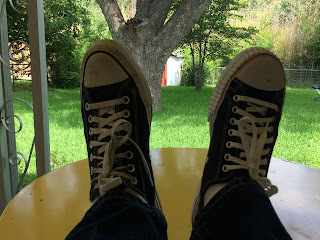 If you've seen me in the last twenty-odd years, there's a good chance you saw me wearing a pair of Converse Chuck Taylor All-Stars sneakers. Powered by 1950s nostalgia, I got my first pair sometime around 1995 and have been wearing them more or less daily ever since. I've had different shades over the years but have mostly stuck with classic black. At first, I wore only hi-tops, but in recent years have been sporting the lo. If I flatter myself to say I have a "signature look," then Converse All-Stars are an integral part of it. I love Chuck Taylors. They are a classic of American design, up there with the Fender Stratocaster, the IBM Selectric typewriter, the Eames lounge chair, the Coca-Cola bottle, and those coffee mugs that have a slight hour glass figure to them--you know the ones. If there isn't a pair of Chucks in the Smithsonian, there damn well should be. Which is why it feels strange to write this with another brand of old-school canvas sneakers on my feet. Namely, PF Flyers. I won't say that I liked Chucks before they were cool. These sneakers have been around, more or less unchanged, for close to a hundred years now. Obviously someone has been buying them all that time. But I did jump on the bandwagon when their popularity was at a relatively low ebb. Sure, Kurt Cobain had sported All-Stars, but for the most part, all the cool kids at the time were wearing Vans and Sketchers. The hip shoe stores at the mall (remember Journey's, everyone?) didn't sell Chucks. I think my mom and I finally found a pair at Mervyn's (remember Mervyn's everyone's mom?). Then a few years later, two things happened: Chucks got cool again, and Nike bought Converse in 2003. In many ways, these were good things. More people buying Chucks meant they were easier to find. This paired with Nike's deep pockets, meant more variety in styles and colors available. Not that I ever strayed very far from classic black, but it was nice to know the option was there. Chucks are pretty well ubiquitous now, and that's all to the good. But something else happened to Chucks post-Nike buyout: the started to get crappier. It seems to me that not only are the shoes not made as well as they once were, they're also less comfortable, though I'm willing to admit that I might just be getting old. And while adjusted for inflation, they're about the same price as they were back when I got my first pair, when you think about the dip in quality and the fact that those old Converse were made in America, they're starting to feel a little like a rip off. So when it came time to replace my worn out Chucks with a new pair this time around--I didn't. Instead, I took the plunge and ordered a pair of PF Flyers. The PF Flyer name has been owned by several companies over the years, and was recently revived. The new shoes were based on patterns from the past, giving them a pedigree more or less as pure as Chucks. They've even got a Sandlot model, patterned after the all-black PF Flyers that Benny "The Jet" Rodriguez wears to retrieve the signed Babe Ruth baseball from The Beast. I went with the "Center Lo" in classic black and white. When the arrived, they looked . . . really weird. They're not quite identical to Chucks and my eyes were so used to All-Stars, that these just looked off. They're wider in the toe area and the soles are chunkier. At first, I kind of hated them. But they were pretty comfortable out of the box, and I didn't want to mess with sending them back. Chucks on the Left, PF Flyers on the Right. Side-by-side, they both look weird to me now. It's now been a little over a week since I got the PF Flyers, and I'm digging them. They seem to fit me better than Chucks do, and so far are more comfortable than I can remember my All-Stars ever being. The weirdness has worn off; they look normal to me now. The only gripe I have is that the opening is rather large and they sometimes feel like they're going to slip on my heel, but they don't, and I'm getting used to it. Will PF Flyers replace Chucks as my go-to shoes? I don't know. I'll have to see how they hold up over the long haul. But so far, I'm thinking that they just might. Which makes me a little sad, honestly. Maybe it's silly to get sentimental over a brand of shoes, but I've walked many miles in Converse Chuck Taylor All-Stars. And what's more, they're something of a symbol for both mainstream and counterculture America in a way that no other sneaker--no other article of clothing--ever will be. I hate to admit that such an American institution may have outlived it's usefulness.